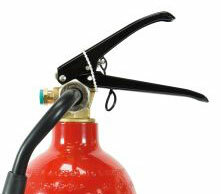 Britannia Fire’s unique UK-developed and made composite fire extinguisher is to be installed across Heathrow Airport’s terminals. Britannia Fire’s P50 – the first extinguisher cased in recyclable composite with a 20-year life span – has been chosen to protect the airport as part of its ambitious sustainability strategy, Heathrow 2.0. 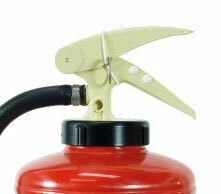 Manufactured in rural Norfolk, the P50 will replace 5000 traditional metal extinguishers across Heathrow’s sites because of its lower carbon footprint and waste, and in-house maintenance. As part of the partnership, Britannia Fire, which exports the P50 in 6kg, 9kg and 2kg forms across Europe and the Middle East, will be invited to promote its products to Heathrow’s supply chain at Heathrow Business Summits around the UK, where an estimated £93m of new deals have been created on the back of partnerships formed from these events. Chris Allen, Heathrow Procurement Business Partner, Engineering, said: “There were many reasons why the P50 appealed to Heathrow. Its lower carbon footprint was one. 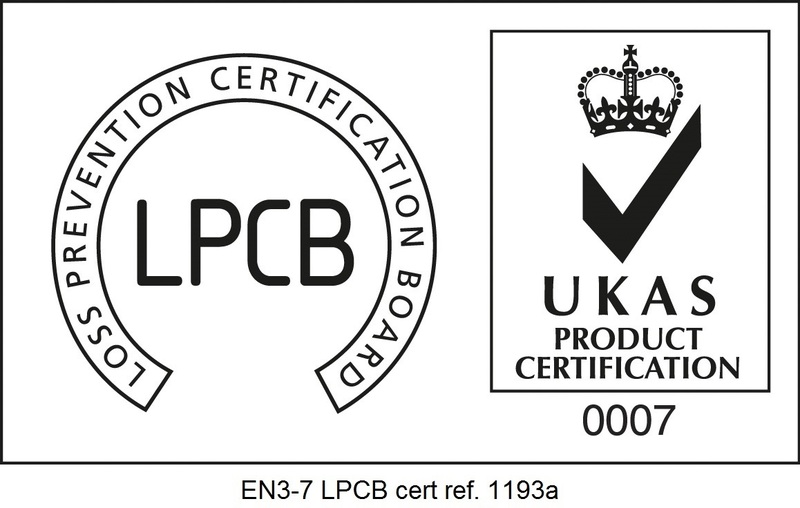 It is manufactured by a UK business and has a European supply chain. “Traditional metal fire extinguishers typically come with parts imported from Asia and with the P50 we will instantly see a reduction in the supply chain carbon footprint by restricting transit from Asia to the UK. 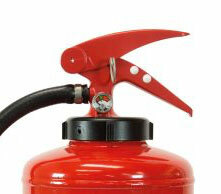 The technology behind the P50 also meant fewer extinguishers were needed on the premises because it covered multiple risks, he said. The P50 was a great example of innovation from a small and medium-sized business (SME), which would help “Heathrow Airport Limited reduce the environmental impact and support our national economy which fits well with Heathrow 2.0 sustainability strategy,” launched last year, he said. Adam Watson, Terminal 5 Asset Manager and project lead, said: “Not only does the P50 support Heathrow’s sustainability objectives by reducing the asset cost base, it is also tightly aligned to our safety culture of getting everyone home safe. Andy Spence, Britannia Fire’s sales director, said the opportunities from promoting the company’s products to Heathrow’s supply chain at Heathrow Business Summits were huge. “Heathrow is such a fantastic brand to be associated with. The airport has set out to work with SMEs, to help them grow and support UK business. 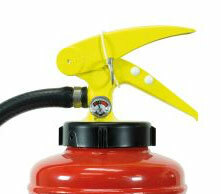 The P50 is the first extinguisher with a multi-layer HDPE molded cylinder wrapped in Kevlar thread and cased in a composite shell cased in recyclable composite. 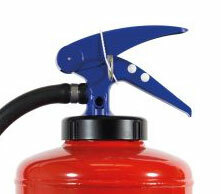 It is manufactured in an old railway building at Ashwellthorpe, where Britannia Fire employs about 40 people. Mr Allen said that, with the launch of Heathrow 2.0 in February 2017, Heathrow Engineering and Procurement saw the opportunity to support innovative small and medium sized businesses (SMEs). 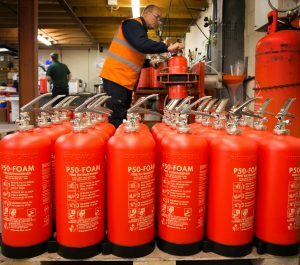 Britannia Fire will refurbish the metal extinguishers to be replaced by P50s and donate them to charity to be shipped overseas. Heathrow is one of the world’s busiest airports with 75 million passengers per year. Mr Spence outlined the P50 to the biggest strategic suppliers to Heathrow, including giants like Balfour Beatty and Mace at Heathrow, last November when he joined a panel with two of Heathrow’s biggest contractors, including Morgan Sindall, and procurement and sustainability directors, answering questions about the business and the P50, its benefits and why they developed the P50. Sales of the P50 have seen a 37% growth in the last quarter alone. Britannia Fire is currently recruiting for another shift at its factory at Ashwellthorpe, near Norwich.